The Obama campaign raises money from official political merchandise: T-shirts, buttons, hats - you name it. Supporters of President Obama, it seems, are more likely to wear their political leanings on their sleeves. The Obama campaign has bought 4 x as much gear to sell to supporters -- T-shirts, mugs, bumper stickers and the like -- as Republican rival Mitt Romney, according to a USA TODAY analysis of campaign-finance reports. Meaghan Burdick, the campaign's director of merchandise and marketing, said in a sworn statement that sales are a crucial part of its overall strategy. Buyers of even small purchases are put on a mailing list and "repeatedly" solicited for further donations, she said. The online store is a central part of driving traffic to the campaign's website, and shipments contain even more Obama campaign literature. Burdick said the campaign raised $37 million of merchandise sales in 2008. The average purchase was $43. Comparable figures for 2012 haven't been disclosed, but the campaign's wholesale purchases of branded stuff are accounted for in monthly filings with the Federal Election Commission. Using that accounting, Obama has ordered $6.7 million of campaign merchandise for resale. The Romney campaign has tallied $1.6 million in orders. An individual's purchase of official campaign merchandise is counted as a contribution, which could help explain why Obama boasts a big advantage in small-dollar donors: 48% of Obama's fundraising comes from donors giving $200 or less; 24% of Romney's money comes from similar donors. "You might have a lot of people who wouldn't normally give a political contribution but might buy a pen or bumper sticker or something like that, who get swept into it that way," said Kent Cooper, a former FEC official and co-founder of Political Moneyline, which tracks money in politics. One of Obama's small-dollar donors is Santos Crespo, who stood in line at the Democratic National Convention in Charlotte last month with two fists full of $10 pins. 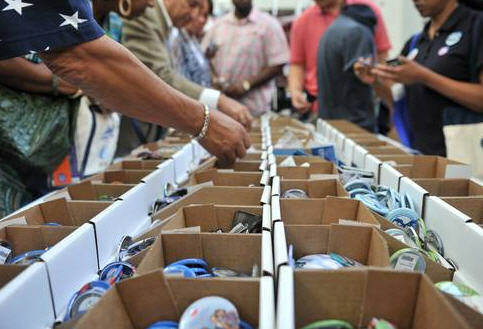 Crespo, president of a union representing 23,000 New York Board of Education workers, said he wouldn't normally contribute, but the pins are union-made, the proceeds support Obama and he can give them as gifts to his staff. "We're competing against the Koch brothers, who are putting up millions," he said. "We need to raise money every little way we can." Among the more unusual items for sale: a $40 Obama 2012 grill spatula, a $12 gay pride dog bandana and a $10 Joe Biden beer can holder. For Romney, items include a $30 silver "R" necklace, a $3 "Catholics for Romney" button and a white, pink or blue baby onesie for $20.12.